Since finishing school I have been having a hard time figuring out what to do everyday. There are a lot of things I have been wanting to do for awhile, but haven’t gotten around to them for various reasons. I have been doing some thinking lately on why I have such a hard time doing what I want to do when I have all the time in the world. The only thing I have come up with is fear of missing out on something. Fear that by going into my sewing room and working on projects years old instead of sitting at my computer I might miss a job opportunity. I know this is just a dumb fear. Job opportunities don’t disappear in seconds. I will hopefully start finding ways to get over a life time of dealing with the fear of missing out this week. To do this I need to make a plan. This is where my love of lists will come in handy. 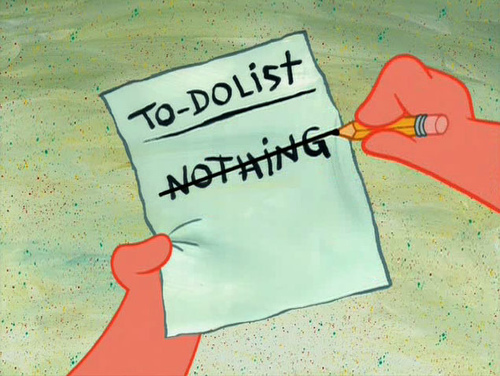 I am going to try spending some time on Sundays writing a list of all the things I would like to do that week. I will then take that list and break it up into smaller lists for each day. I think limiting my time spent reading other blogs each day will help. I think that looks good. I am still trying to decide what I want to do each day. Since this is the first week I am trying this out I am going to go about completing these naturally. Each day I will complete at least one workout. I have 8 planned. One of the weight workouts will be my weekly bootcamp at Lyons Fitness. I am planning on going to Boulder on Tuesday and Wednesday so it will be easy to swim those days. I think this new plan of attack will end up working out good. I will report back on how I did at the end of the week. Posted in Uncategorized and tagged job hunt, routine. Bookmark the permalink. 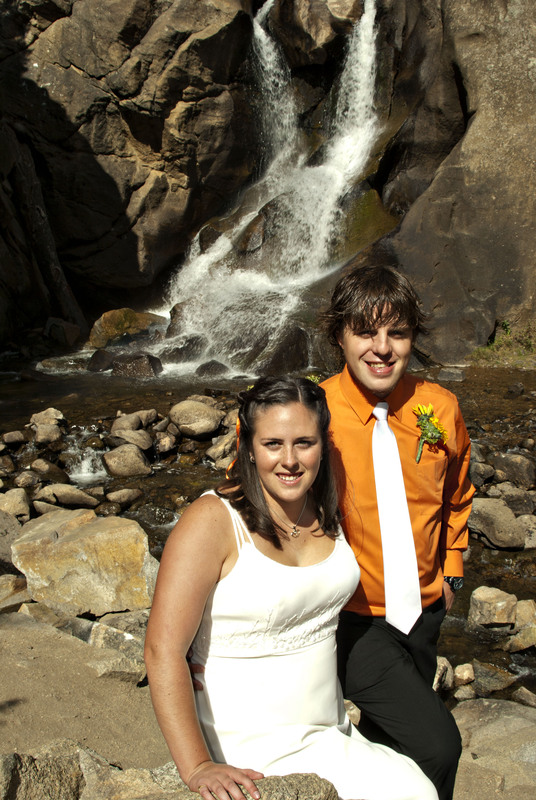 Why has it taken me until now to write about our wedding that happened in September 2010? Probably because it was far more emotional and life changing than I thought.I have been thinking about writing this post since the day after our wedding and I finally think I understand what changed that day enough to write about it. The best place to start this post is pre-engagement where I was so desperate for J to ask me to marry him, but could not figure out why. I watched my friends get engaged and felt like I was a failure, like I was doing something wrong. I never understood this feeling because until moving to South Dakota I had no desire to get married and I surely was never going to let a guy make me go crazy over something as stupid as a ring. A ring. I did not even want a ring. Or so I thought. We got engaged on a trip to Steamboat Springs, CO. It was a magical weekend for us and to this day still more important than our wedding day. We waited until I graduated to start planning the wedding. When we started planning all we really knew was that we wanted a wedding that really reflected who we are as a couple. Which meant something outside and simple. After lots of searching and debate we settled on a lodge in Four Mile Canyon. It was beautiful, rustic, and had a creek running through it. We went the route of doing everything ourselves. We asked a friend to be our photographer for the ceremony and a neighbor made our amazing wedding cake. Instead of a rehearsal dinner we decided to invite all of our friends to go to the Great American Beer Festival. This was an absolute blast and for us the best way to spend the night before our wedding. The day of the wedding dawned with fog and a drizzle. My dad promised me that it would be sunny by the time the ceremony started. This became my mantra as things progressively got worse. I washed my hair and left it down to dry and then headed off to collect my bridesmaids for breakfast. When the time came for me to go get my hair done (a gift from the lady who has cut my hair my whole life and our second photographer) I a had a rats nest on my head thanks to the wonderful moist air. We had to re-wash and dry my hair which took forever. This put me about 30 minutes behind schedule, which meant I was going to be driving through Boulder right before a big CU football game started. I got to the lodge and one of the groomsman came running up to grab the laptop that had all of the music for the ceremony and reception. Awesome. I ran inside and got dressed, threw on some make-up, and tried to calm down. The ceremony was going smoothly and I was smiling as big as I had ever smiled. When it came time for my sister in-law to read a poem we realized that no one had a copy of it for her to read. So we all just laughed and finished the ceremony. After the ceremony the wedding party and our photographer friend piled into a vehicle and drove up the canyon to the Boulder Falls to take a few pictures. As we were taking pictures a ranger dude came up and told us that we were not supposed to be taking pictures there and that we would have to leave if we had a professional photographer. Since we were the only people there he let us stay. We took some beautiful pictures and headed back to the lodge. From what I can remember the rest of the night was perfect. We ate or at least everyone else ate. I could not get any food down for some reason. Drank lots of beer. Listened to Jason and his fraternity brothers sing a song to me. Played lots of lawn games. Ate the most amazing cake I have ever had the pleasure of eating. Had our first dance (we danced to Don’t Stop Believing by Journey) off to the side so the only person that saw our very special moment was my aunt who snuck some pictures. We should have known from our engagement that we were going to have lots of things go wrong with our wedding. Who forgets most of their cloths when they go to Steamboat for the weekend? Only us. I totally forgot to write about the Four Mile Canyon fire that made it so we almost had to re-plan our whole wedding days before. This was one of the worst fires in the history of Colorado fires. It started just 7 miles from the lodge and was not contained until 3 days before our wedding. The canyon was not opened until 2 days before. We went up to the lodge on Friday morning and they were still using the lodge as a staging ground for the fire fighting. Some how the higher powers made everything work out and we were able to get married at the lodge. We enjoy looking back and laughing at how much went wrong, but how it all ended up working out. I learned so much about myself and our relationship. It took me two years to realize why I so desperately needed a wedding and why at such a “young age,” but I am glad I finally figured it out. We have known since the very beginning that we would spend out whole lives together. When J gave me my first heart necklace we both made a silent commitment to each other. To us we were married with that silent commitment. We did not need a piece of paper to be married. But I felt that there was something missing and I could not put my finger on it. I hated how people treated us because we did not have that special piece of paper. We needed an event to help me and our friends and family make the transition from steady couple to married couple. I feel like I have so much more in me that needs to be said on this topic, but it is very draining for me. Maybe later I will do some more writing on this subject. 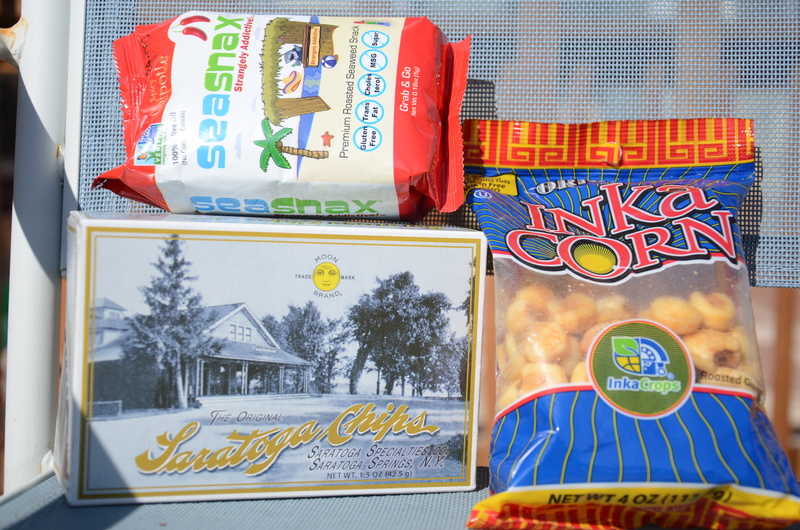 This month I got my box from The Wannabe Foodie. I read some of her posts and I knew I was going to get a good box. I opened the box and was shocked. It looked like my husband had put it together. 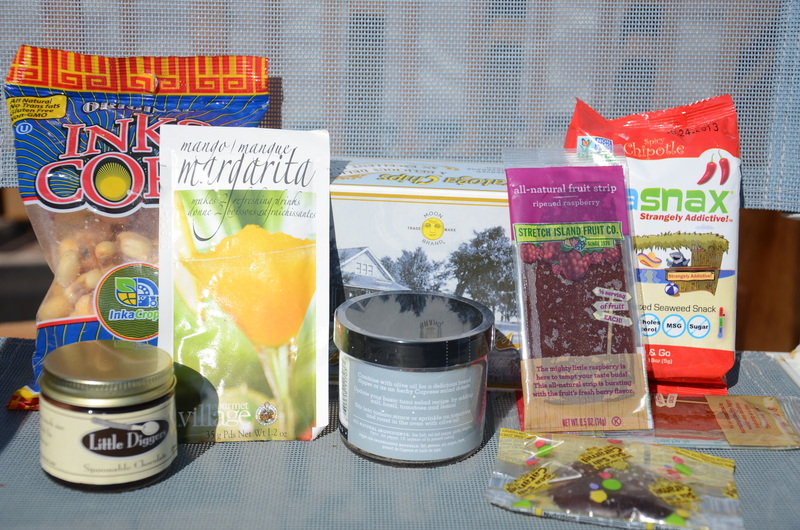 There were my favorite fruit strips, margarita, spoonable chocolate, giant corn things, chips, seasoned salt, seaweed snaxs (which I have been meaning to try for months now), and the most amazing thing ever a salted caramel chocolate. These are the kinds of treats only my husband would know to buy me. I have been on the hunt for the perfect sea salt chocolate for about a year. I thought I had found it until I took a bite of this one. It is a salted caramel covered in dark chocolate. One bite and I was in heaven. I cannot believe that I finally found the perfect chocolate. Now I just need to figure out how to buy more. 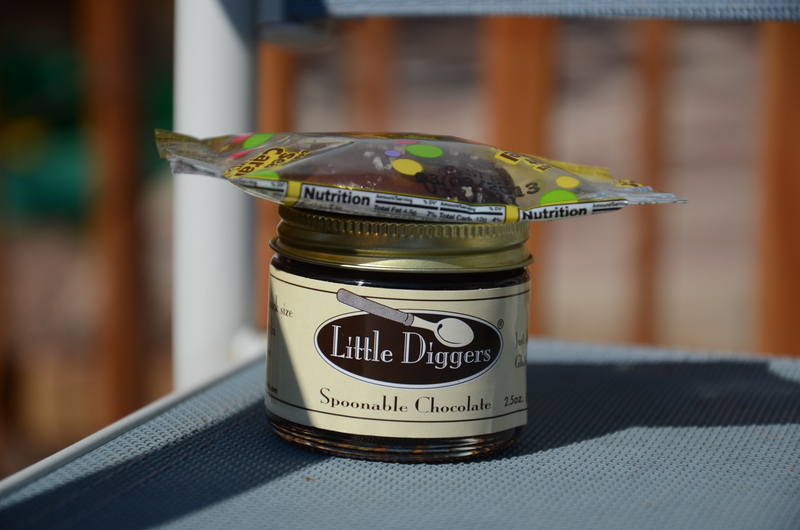 Spoonable chocolate is the best invention ever. I have a baby spoon that was left at my house years ago. It is the perfect size for eating chocolate. I have been keeping the spoon on the counter so I can easily grab a spoonful. This is so much better than my usual nutella. 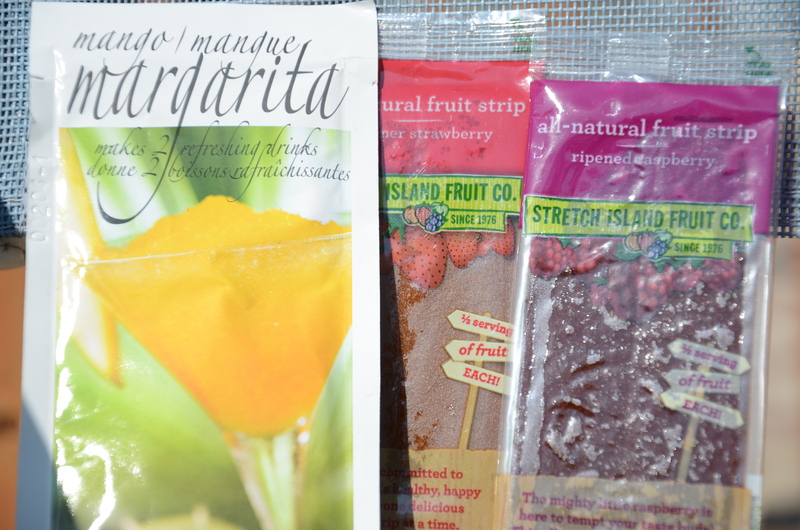 I love margaritas, mainly because they have tequila in them, so I was excited to try this mix out. I decided that I wanted a frozen drink, so I made it and threw it into the freezer for a few hours. I don’t usually like mango flavored drinks. The first glass was not very good. The second one, eat the next day, was so good. I might have to try a mango margarita the next time I get one. These are my all time favorite on the go snack. I have been eating them for as ling as I can remember. When I saw them I was excited since my stash was empty and I hadn’t seen any good deals for them lately. I never buy seasoned salt even though I really want some. This one looked really good. I planned to make some baked chicken with it. Before putting it on the chicken I tasted it. It was yummy. I was very excited to see what the outcome would be. The chicken tasted so so so good. I can’t wait to make some other dish’s with this. 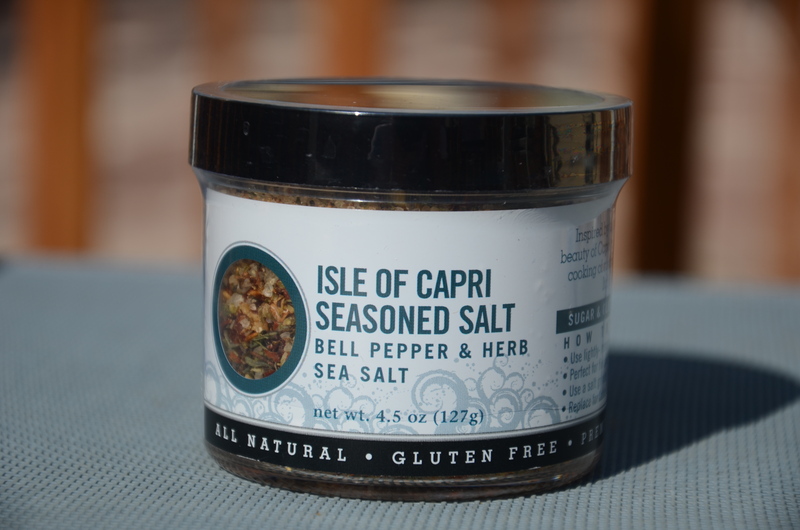 The husband said he wished it wasn’t a seasoned salt and just the bell pepper and herb mix. I might have to check Savory to see if they have something like this that isn’t seasoned salt. The sea snax brand seaweed has been on sale for months at King Soopers. I keep meaning to buy some, but always space it. I was excited to try them finally and they did not disappoint. The flavor was amazing, but did not totally overwhelm the seaweed flavor, which I really liked. My only complaint is that they were too spicy to eat more than one at a time. The inka corn was so yummy and fun too eat. I really liked that there were no bad ingredients. Seratoga Chips! These are not like any other potato chip I have tried before. I am usually not a fan of potato chip, but these definitely were good. Posted in Uncategorized and tagged foodie penpals. Bookmark the permalink.